1. Only online application submitted before the closing date will be accepted. Application form sent in any other mode will be rejected. 2. Incomplete application and Applications submitted without photograph along with signature / relevant documents / application fees, if applicable, will be summarily rejected. 3.Applicants are advised to note down the generated Application number. 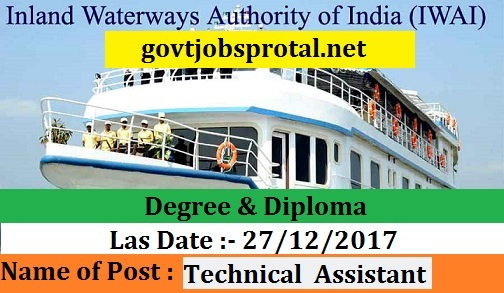 b).Diploma in Civil/Mechanical/Marine Engineering/Naval Architechture from a recognized institute viz 3 years experience in an organization for carrying out works in the relevant field. 1. Applicant has to read through the instructions and click the button “I Agree” check box provided at the bottom of the form after declaration, if applicant is sure that he/she meets the prescribed eligibility details for the posts for which he/she wants to apply. 2. The Authority is following Central Govt. rules and orders in service matters. Leased accommodation and medical reimbursement are provided as per the rules of the Authority. 3. The vacancy shown against above mentioned posts is tentative and may increase / decrease depending on the requirement of Authority. 4. The post has all India transfer liability; candidate selected for the above mentioned maybe posted in the Regional offices of Patna/ Guwahati/ Kolkata/ Kochi and other suboffices of IWAI at Varanasi, Allahabad, Farakka, Sahebganj, Vijayawada, Kollam, Chennai and other regional offices / sub-offices likely to be opened in future. 5.The syllabus of the written test (online/ offline) shall be the standard of prescribed eligibility criteria; which may consist of 120 multiple choice objective questions ( with 1/3 mark to be debited for every wrong answer), consisting of Part-A & Part-B ; Part-A consisting of 100 questions shall be technical in nature, covering the syllabus of prescribed eligibility criteria for the post and Part-B consisting of 20 objective MCQ shall be from the General awareness, General reasoning / Gr English / Numerical ability & general Arithmetic of the 12th Standard and time allotted will be 2.30 hour. Written test is likely to be conducted in the 2 nd / 3 rd Sunday of Feb’2018, for which candidates shall be required to download the Admit card from the web-site of IWAI only. (You will get more information in employment News paper dated on 09/12/.2017 Page no.(37).) Visit the official website for more information.